In this article, we’re looking at the best lithium ion jump starter options. Lithium Ion technology has changed virtually every type of technology we use which takes a battery. A jump starter is so reliant on having a battery which can last a long time before you call upon it. Lithium Ion is the best sort of battery for this. They are wonderful products to take out and about with you, to keep you safe when your car’s battery dies. We’ve included detailed reviews to help you choose. 3.2 2. Rugged Geek RG1000 1000A Portable Car Jump Starter. 4 Do I need a Lithium Ion Jump Starter? 5.1 1.Can I charge a battery, laptop and phone with a lithium ion jump starter? 5.2 2. How to Use a Li-Ion Jump Starter? 5.3 3. Where Should You Store The Jump Starter? 5.4 4. How Often Should It Be Charged? 5.5 5. Are These Products Dangerous? The numerous benefits of these types of products include their huge amount of charging power. They allow you to charge once and can then hold power for a long period of time to use when you need. Flashlight functions can also be helpful to help you see if your car stops working and you are in an isolated spot. Jump starters also often have USB ports to let you charge your devices on the go. This is great if you need to get help from emergency services and your phone is out of juice. The BASAF 1200A jump starter is a very powerful jump starter which is suitable for even big and hefty cars as it can work with up to 8.0L engines. Even if you have a big car with a powerful engine, this will do the job even if your battery is dead. 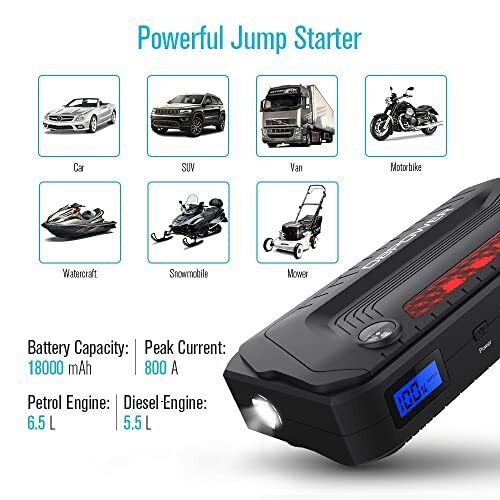 It is a very reliable model of jump starter which can hold its charge for 6 months even if it is just sitting in the trunk of your car. You don’t have to constantly recharge it to know you are safe. This product is built to last and can give many years of use. It is also pretty small so it doesn’t take up a lot of space in the trunk. Clever features include a lot of inbuilt safety functions, so you can rest assured it is safe whoever is using it. Eight different safety features to protect users and the unit itself. Two year warranty and 30 day money back guarantee. Comes with jumper clamps, cigarette lighter adapter and case. Can quickly charge other devices with USB C charging port. LED light also comes with flashing SOS function to show danger. No easy indication of whether it is charging or not. 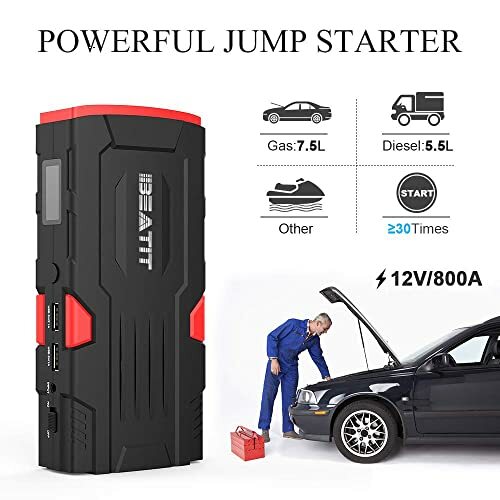 The BASAF jump starter is built for people with large vehicles and big motors. It works well for people who may need to charge their devices while they are out and about too. This is one of the best jump starters on the market when you consider its size and portability. The DBPower looks more like a computer peripheral product and could easily fit in a glove compartment of a car. In spite of being compact, it still has enough power for even relatively large vehicles. You don’t have to worry about this not being able to get you going again. As well as having two outputs for charging devices, it is pretty simple to charge. 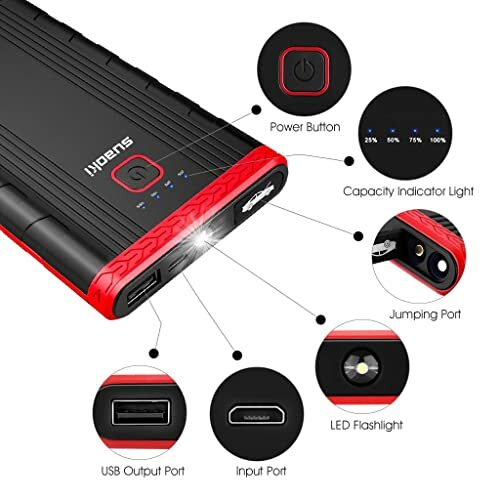 There are also plenty of safety features included with the DBPOWER 800A Peak 18000mAh jump starter so that you don’t have to worry about accidents. The product is well built as you will feel straight away if you purchase it. This means that it will last you a long time. LCD screen shows battery level and if charging. Can be used 20 times before having to recharge..
Small enough to fit in most glove compartments. Dual outputs let you charge your devices in a tough spot. Safety features stop reverse charging or other dangerous risks. Doesn’t hold charge as long as some other competitors. May break if dropped due to its compact size and design. The DBPOWER 800A is a good choice for people who want a very compact lithium ion jump starter. It is arguably the best portable jump starter in terms of its size. It is a good choice for most vehicles whether small or large and has loads of safety features. This is a durable and excellent quality jump starter that can hold lots of power. In the words of the manufacturers it has ‘up to 11 days of power’ stored within, with 18000mAh. 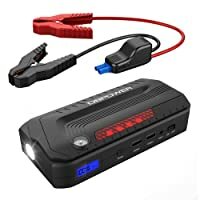 If you are looking for something to take out and about with you to remain safe in the event of a battery dying, this is good for multiple vehicles. The Beatit D11 has been designed for use with any gas or diesel engine on boats, motorbikes, cars or even trucks. In spite of this it can still be stored in the glove compartment with ease. This is another lithium ion jump starter which has embraced technology and has LCD displays and ‘smart’ technology built into the clamps to protect the user. LED flashlight includes an SOS setting. Charging ports for two devices. 2 year warranty combined with customer service for life. Technology stops it from sparking which can be dangerous. 7.2 x 3.5 x 1.5 inches in size so small enough for glove compartments. Tested to work at virtually any temperature. A few users have reported defective units. Charge lights can be difficult to understand. This is a good option for people who want a durable product which can still charge batteries at challenging temperatures. It is relatively compact but still has plenty of power. DBPOWER 600A is a great jump starter for people who may need the features of a compass in case of getting lost. You can use it to charge your laptop. The DBPOWER 600A is in the same range as the 800A model which we have also reviewed in this article. It has some good additional features as well as being a pretty powerful and clever jump starter. This is an impressive product as it is quite compact but also has its own little case which is great for keeping it safe. It is well built and can be kept just about anywhere you like within the car. The DBPOWER range is very good in terms of longevity so should last you a long time once you have purchased. On top of this, they’re very safe products and the brand has put a lot of time and effort into the safety features. Starts vehicles with up to 6.5L engines. Can store enough power for 20 charges. Has the capacity to charge from a USB port or to charge laptops at high speed. LCD screen has both power percentage and a compass in case you are lost. Jumper cables are always active when turned on. Cables could be a little longer. This is a great jump starter for people who may need the features of a compass in case of getting lost. The DBPOWER 600A is also great for those who often have their laptop on them as it can charge this if you need to. 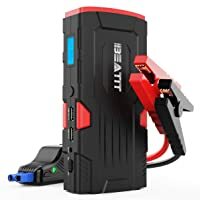 Beatit is a range offering more than one jump starter and they are known for their good quality batteries as well as impressive features. The Beatit G18 PRO is arguably a little more modern than some of their other jump starters and has some innovations. 3rd Generation QDSP Lithium Ion battery. As well as being fast to charge, reliable and even relatively small, this has some other added bonuses. The main impressive feature is the fact that there is wireless charging which many devices now support. The Beatit G18 PRO also has a lot of power so it can jump start even hefty and powerful engines, as well as doubling up as a power bank. The modern, 3rd generation battery make this a great li-ion Jump Starter. Can be used over 30 times before recharging. Can jump start up to 8.0L engines. Includes LCD Display and compass. Full of safety features including reverse charging protection. More expensive than competing models. Runs quite hot at times, especially starting large engines. This is the natural choice of battery jump starter for people who wish to use wireless charging capabilities. It is also a clear and obvious choice for people who need to jump large engines as it can work on up to 8.0L models. The RG1000 is a portable jump starter which does what it claims to in terms of being rugged. It is a well made piece of equipment which should last many years with the right treatment. Wall charger works between 110 and 220 V.
If you need, this can be purchased as an option with an added air compressor. If you don’t need this, however, you are still getting a quality li-ion jump starter with smart features. Rugged Geek have paid close attention to safety features so that you aren’t putting yourself at any risk using the RG1000. Allows you to choose voltage output from 12, 16 and 19. Intelliboost cables have been included to reduce health and safety risks. Comes with 3 in 1 charging cable. Can start gasoline engines up to 7L. Can charge from USB or Laptop port to allow charging for most devices. LCD digital display so you can see charge percentage and other details. Comes with LED light which can be used in SOS mode if needed. Not on the cheap end of the market. Only starts diesel engines up to 3.5L. This is a good all around choice great for any user who is worried about safety. The intelliboost cables give peace of mind and the flashlight may come in handy. 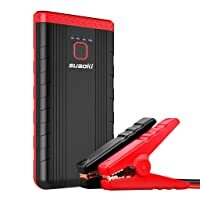 The Suaoki U3 is worthy of being included on our list of best car jump starters because of the fact it is great value. It is always good to include an affordable product for those on a budget. The Suaoki U3 400A Peak Jump Starter is a cheap jump starter with a li-ion battery. It does have some limitations such as only really being suitable for modest sized engines. This can only work on engines up to 2.5L in capacity. A lot of first cars or just family cars are well below 2.5L, but be sure to check your vehicle. Though it isn’t the most powerful for jump starting it has plenty for most average cars. This also has the same portable power bank abilities as the other products on the list. It is also very small, portable and convenient. Very compact and can fit in the glove compartment. Affordable, one of the cheapest lithium ion starters. Can be used as a power bank. Has smart clamps to prevent accidents. Includes LED flashlight and battery indicator. Can’t charge the battery of large engines over 2.5L. USB port not compatible with all models of Samsung device. The Suaoki may not be for everyone, it isn’t likely to win any awards for jump starting trucks any time soon. The U3 is best for people who are on a budget and who have smaller vehicles. It may be enough for your own individual needs. This is our top recommendation. It has the power to jump start even large engines up to 6.5L. It also has up to 18000mAh capacity in terms of battery, and holds charge for a long time. You can charge not just portable devices but also laptops. 2. Rugged Geek RG1000 1000A Portable Car Jump Starter. We would probably call this the safest portable jump starter. It also has a good balance of other features. It can charge your devices, has an LCD display and is both lightweight and compact. The beatit D11 has a lot of great safety features too making it a positive choice, it also has two charging ports for other devices and is available at a reasonable price. Do I need a Lithium Ion Jump Starter? It makes perfect sense to have a lithium ion jump starter in your vehicle. No matter how reliable your car is, batteries can die for a lot of different reasons. Having a lithium ion jump starter means that you won’t need another car to get you going again if the worst happens. You can get other types of battery jump starter, but li-ion is definitely the best technology available meaning it will last longer. If you are stranded in the middle of nowhere, most of these jump starters can also let you charge devices to contact someone. 1.Can I charge a battery, laptop and phone with a lithium ion jump starter? It is important to check each model to see what they offer in terms of charging. Most can be used as power banks and at least have a USB output for charging devices. Some also allow you to charge your laptop. 2. How to Use a Li-Ion Jump Starter? You need to connect the positive clamp to the positive terminal on the battery. You should then connect the negative clamp to a ground location and switch your jump starter on. After a while, check if you can start the car. If so, safely disconnect the jump starter. 3. Where Should You Store The Jump Starter? Either in your trunk or your glove compartment depending on how much space it takes up. Try to keep it somewhere the temperature is not too extreme, either hot or cold. 4. How Often Should It Be Charged? The jump starter itself will be sold as a rechargeable jump starter, meaning it needs to be charged regularly. Fortunately, most have an indicator of their charge level on them. Switch it on once a week or even more just to check that it has plenty of battery life remaining. 5. Are These Products Dangerous? As long as you know what you are doing, these jump starters should be very safe. Most are now made with a lot of extra safety features to ensure no reverse charging or other dangers. Hopefully our guide can help you to make the decision on what is the best lithium ion jump starter for you. Check out the product descriptions for more information on the products and ensure you make the right choice.